Welcome to the pilot episode of this sewing podcast. This is Season 1 Episode 1 – and to kick it off . . . I’m giving you a quick tip for threading sewing needles. If you’ve ever had any difficulty with threading, even if you’ve felt like the eye of a sewing needle is the problem, this tip will help you! And as you become a sewing ninja, you’re going to inevitably find ways to do certain sewing tasks faster. Like threading needles. You’ll eventually figure this method out after a couple of thousand hours of sewing, so you might as well know now, and save yourself some time . . . just listen and follow along. Let me know your experience with this sewing needle threading technique, or just let me know you’re listening @sewingtheory – and throw in the Tweetable while you’re at it!! This podcast is here to help sewing creators who have big ideas for what they want to achieve. It’s a resource to help you do that. This episode is dedicated to helping lay the foundation for how to build and optimize your creative momentum so you can reach your sewing goals faster. I’ll be revealing a 3-Stage Process - a Habit Loop to help get you there. Every creator is at a different point of their sewing journey and has a set of skills unique to them. So as you listen to this podcast episode, just put into your mind that fun thing you've been looking forward to creating…You might be making this for you or for someone else. It doesn’t really matter, just think on it while we move forward. If you're thinking about your sewing goal, you're probably wondering how you are going to make it happen? How will you actually get there. It can happen in one of two ways. Some people go about achieving their sewing goals in a very regimented way or a haphazard way. And it’s usually a method based on their education or employment. Both have trained a majority of people to think and take action starting by way of list making or planning. All of that is normal. But I'd like to dive into something different today - it’s a new way to look at your sewing goal. It’s a new way to think and take action that makes a difference. -or struggling with the vast pieces that make up your quilt. And you don't want that to be your reality for very long. You'll give up before you get any real momentum going. If this is what you've been used to doing and how you're feeling it means that you're slowing down your progress. You're also probably a little bit frustrated with how successful your goal setting has been so far. So since you're probably already an action-taker, you’ll need to change your frame of mind - shift your mindset. 1 - Why is this goal so important to me? 2 - How will I feel when I have reached my goal? Stage 1 - Be playful. Why? It raises the level of fun and anticipation in your body, puts your mind in a mode that supports creativity. It's easy to take action when you're in a good mood. Just don't sew or create anything if you're not feeling good or optimistic about it. You want to make sure you're in the flow of a good-feeling energy. When you feeling Stage 1, it’s your green light to start creating! Stage 2 - Learn from your results. Why? To fine-tune your work and reach your goal faster. The point of this stage, is to evaluate only the thing that has been created. You’re not evaluating yourself. Keep “you” out of it. "Now that I know/see this fill in the blank . . ..
"What can I/should I do differently next time?" And you don't have to know the answer right away, but really look at your results, because it will give you a prompt or a clue on the direction you need to go. If you're upset about what you see, step away from your project. You need to step away and go do something different, go somewhere else and get yourself back into your happy, playful, optimistic, enthusiastic, or hopeful mood. You might need to take a break and eat. Get some vitamins into your body and energizing nutrients to your brain. You might need to take a nap, or get a good night's sleep if you’re not in a good place at all. The importance of taking time out to chill or get playful is that your creative genius, momentum, and your best answers … your a-ha moments will be improved. With out it, you stagnate. And problems continue. Stage 3 - The bigger perspective. You'll need to get yourself into the hopeful mindset if you've had to step away from your project after seeing your results. Is the topstitching or edge stitching uneven? Has the pocket been pressed - sharp and flat - but the edges appear crooked? Is the placement on this plaid fabric - matching the pattern of the plaid? There are lots of insights to gain in each of these questions, and we cover each of them in the podcast. That's where you need to go back to when you can’t find a better feeling perspective about what you’ve achieved with your project. 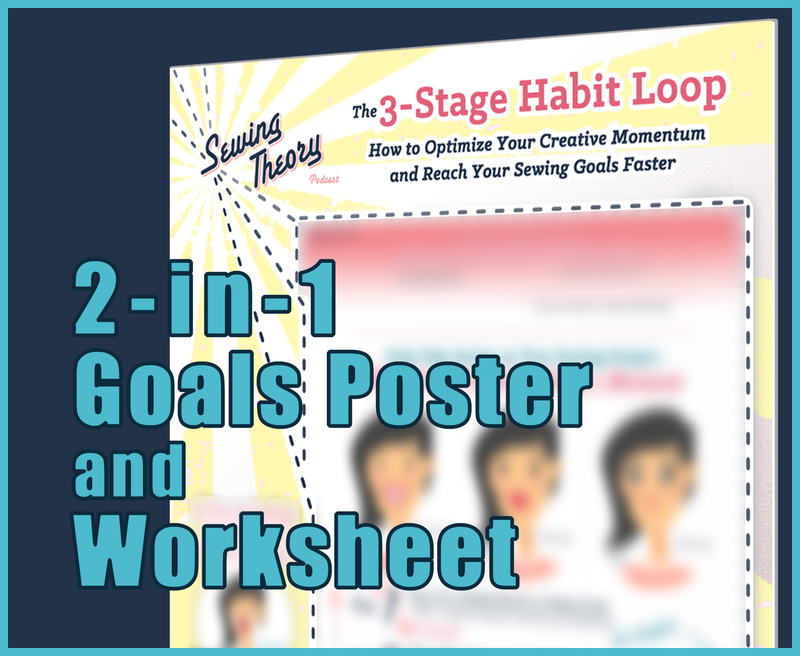 So that's the 3-Stage Habit Loop for optimizing your creative momentum to reach your sewing goals faster. I’m telling you right now that you can start anywhere when you have a goal, because you'll quickly realize when you think what you're doing is boring or if it’s really fun. If it's fun and you can see potential, keep going and then repeat this Habit Loop within every project. If it's boring and you’re overwhelmed, go to Stage 2 to find out what you liked . . . then find a new and different project that has some of those qualities you liked as your next project to try. And repeat this process until you find things that you like sewing! Sew until you achieve your goal by staying in the Habit Loop. Now for this week's Notable Quote: It comes from Walt Disney. This marries well with the idea of taking action. But remember - only start “doing” when you're in a good place - an happy or optimistic or hopeful place. It’s how I'm here today talking to you. I never started the planning part of it - the part where I'd normally make lots of lists and get overwhelmed thinking through all of the details about all sorts of things. If I had gone about it that way - my typical Sandra way - the way my design background trained me to do well - then you would not be listening to this podcast right now. Instead, I just let things unfold. I didn't rush anything along if I didn't feel the fun in it. I had been thinking about a starting a sewing podcast, thinking it could be fun for a few weeks. And one day, when I was in a good mood, a name for the podcast just came to me. It felt like really good to me to think about it, and it got me excited. So I bought the domain. Then I went about my normal life. I relaxed into myself, and leaned toward feelings that kept me in an optimistic place about my family, sewing business, and life. And a few weeks later, exhausted from a long week of work, kid stuff, and house stuff -- I started putting extra hours into the project that was no fun. I was feeling overwhelmed and pessimistic. So I asked myself to find a Stage 1 feeling, what sounds fun right now? So I decided to give myself an hour or so of creative fun. I had been thinking about a color palette that felt good with the podcast name I picked. And it was fun, looking at fonts, playing with color. That was a Stage 1 moment. I finished the branding idea. It felt really good. That was a Stage 2 moment. And I looked at it every now and again. I still liked it after a couple of months. That was a welcome surprise!! Then an opportunity came to start this sewing podcast. And I asked myself if it still sounded fun. And it did. It sounded like it was a jump start my battery. So I took the opportunity that helped me get this podcast going. That was my Stage 3 moment for this creative project. Now, I’m relatively new to this whole world of podcasts. I had only been listening to them for a couple of years. And I only thought it would be cool to start a sewing podcast about 3 months ago. I didn't really do anything to produce this podcast until about 3 weeks ago. And I'm having a blast!!! I’m fueled by all of that momentum and want you to know that I'm here to help you find that same kind of momentum for achieving your creative goals. So yes, "Quit Talking and Begin Doing" but only when it feels fun! Thanks Walt! Thank you for listening this week, this brings us to the end of another episode of Sewing Theory Podcast, I am your dedicated host - Sandra Espinoza, with you every week - and I'll be back with you next week with help to get you out of a sewing rut. Remember to sew with intention, because every stitch you make matters.